The nail supply I go to finally had OPI's San Francisco collection the last time I visited! Yay! At last! Trouble was that they also had the Mariah Carey holiday AND Miss Universe collections. I had to do some very painful picking and choosing. I only bought two from San Francisco, three from the xmas bunch, and This Gown Needs A Crown. It was quite a mighty haul in total (there were also Orlys and a few China Glazes, among others), but the OPI's were the only ones I really struggled to pare down. I think I had maybe 15 in my basket at one point. I have an OPI problem. If it's not pink, pastel, or Liquid Sand, I probably want it. I even want some of the Liquid Sands! OPI is absolutely my favorite brand. I'll almost definitely wind up with at least 3-4 more shades from this collection eventually. I went typical and got the two shifty shades, of course. 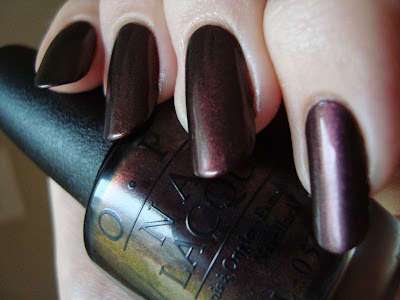 Muir Muir On The Wall is a subtle plum/burgundy/copper multichrome shimmer. The shift on Muir Muir is decidedly on the subtle side, but I like it. It feels sophisticated somehow. I swear there are moments when there's the slightest hint of green, but it's very faint. The overall look is very autumnal. This is three coats, since it's fairly sheer. It's got a little bit of brushstroking, but nothing terrible. Even when the shift is at its weakest, it's still a really pretty sort of cordovan color. 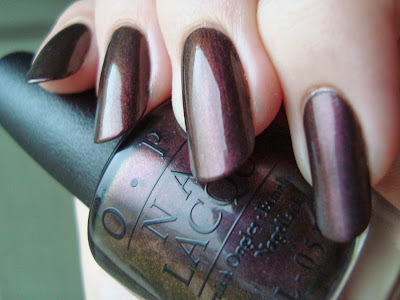 Peace & Love & OPI is a smokey blue/lilac duochrome. I'm almost tempted to call this a metallic finish. There's something silvery about it, even though the lilac usually dominates. This is two coats. It's considerably shiftier than Muir Muir, but also a little bit more prone to brushstrokes. Again there's a suggestion of green that never fully materializes. It's a really paradoxical color in some ways. It's got a dark-ish base, but the shimmer borders on pastel. When you get it to almost stop shifting, you notice how dark the base actually is. Bottom line: I like both of these a lot, but I wouldn't call either a must-have. Both have good formulas and a fair amount of visual interest, despite being a bit understated where the shift is concerned. If you're looking for oomph, you'll be disappointed, but they're still very pretty. What collection or brand have you had trouble not bingeing on recently? Putting them back is so hard, isn't it? I love Peace and Love! Beautiful!